I noticed a lot of students going to school in casual clothing. You know something's up when they're not in their uniforms. I learned later in the day that it's Mufti Day. Mufti (pronounced Muff-tea) refers to casual or ordinary clothing. Think shirts and jeans. Mufti day is observed in schools here as a fundraising scheme for a cause the school is supporting. There were still a few students who came in uniform; made me think that they might have missed the announcement. After all, what student wouldn't want to wear jeans in school? But a vast majority looked very comfortable in casual wear. They will then give a gold coin donation for their cause (a gold coin is either one dollar or two dollars, so called because of the color of the coins in these denominations). This is a fun way to raise funds, and I'm sure it can also be a popular "event" in the Philippines where we are expected to wear smart, office clothes from Monday til Friday. Winter is only about a week away... my family's first winter ever. 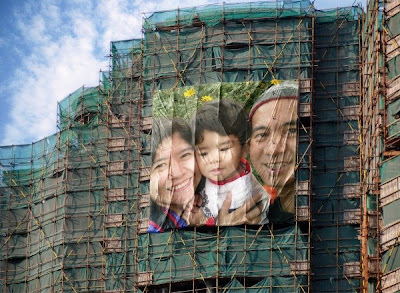 When friends here learned that we are from Baguio, they said we have an advantage because we would be better able to adjust to the climate here. Well, I can say that this may be applicable only for the spring and summer time when the temperature here is quite agreeable. But autumn has heralded the arrival of the cold season, and the winds amplify this to a considerable degree. We now wear at least three layers of clothing, and we have two duvets to keep us warm during the night. We have brought out our heater, which occasionally brings us some degree of warmth as we huddle beside it while watching TV. I have heard other people saying that the knitted clothing you buy in Baguio is useless if you pit it against this weather. That isn't exactly correct. People here cope with the weather by layering clothes. Knitwear from Baguio can be used as one of the inner clothing, then topped by a waterproof jacket (it's looking to be a very wet winter). It is strange, though, that my officemates in Manila would ask me to buy knitted stuff for them, and a lot of sweaters have passed through my hands. But I personally do not have any of these warm sweaters. Have you ever had that thought that some things you see around you for the longest time will always be there, and you can always reach out in case you need it? That was my line of thinking then. We have, however, some bonnets and mufflers from Baguio and these provide additional warmth. 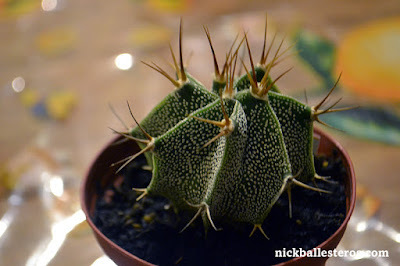 I will be sure to visit MarBay when we return to the Baguio for vacation and make some major purchase. In the meantime, I have my muffler to keep me warm and remind me of home. The first thing that my friends said when they learned that we were moving to New Zealand was that I must send or show photos online of this country which they only know of as having more sheep than people. Of course, the Lord of the Rings movie also played a very important role in putting New Zealand on the map, along with the latest Amazing Race zipping its way across Auckland. But thanks to another Google innovation, people no longer have to wait for others to post photos about New Zealand or other countries for that matter. 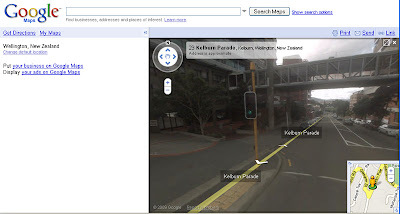 One can take a virtual tour through Google Maps! 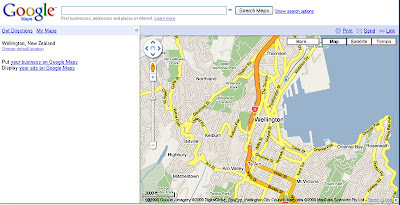 First, point your browser to http://maps.google.com. Then on the search field, type in the name of the city you would like to tour. 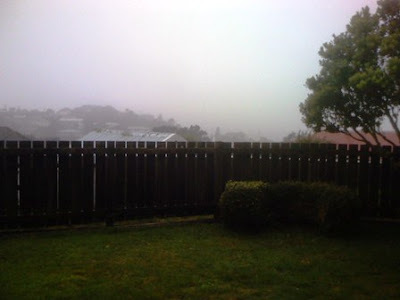 In my example, it's Wellington, New Zealand. You will then be directed to the city of your choice which you can view either as a map, a satellite image, or a terrain. The map version is shown below. You will notice at the upper left of the screen is the directional circle whereby clicking on an arrow will move the map to the direction indicated (although I find it easier to drag the map around). Immediately below this circle is the icon of a person. This is where the virtual tour starts. If the person is colored yellow, then it means that the Google Street View is available (otherwise, it's in gray). Using your mouse pointer, grab that person and then lift it off and drag it onto the map. Immediately below this person is a circle which shows where he will be landing, as well as a screenshot of the street. 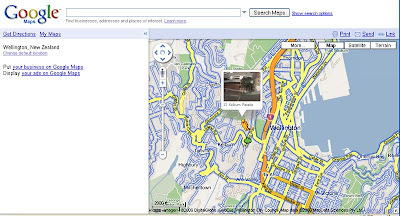 The roadways for which this feature is available will also be highlighted in a blue outline. 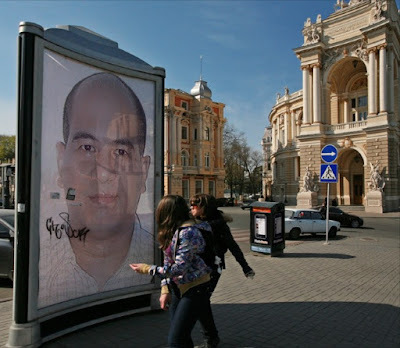 Drop the person onto a street and voila! Actual view of the street! You can take a 360-degree view of the street, and move forward and backward. Really amazing. 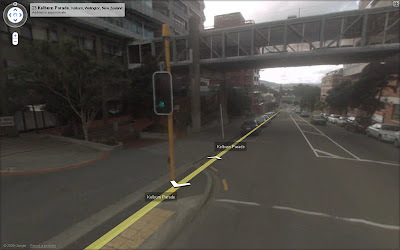 At the upper right section of the screen is a zoom feature (in the form of a square) beside an X (which terminates Google Street View and returns you to Maps). Click on the zoom feature and the street feature takes up your entire computer screen! This is a cool and useful feature. I find it very handy for times when I have to go someplace and this is a great way to familiarize yourself with your destination. You will also notice that there aren't really a lot of people here in New Zealand. I am still amazed at how very few people are walking about in the city on weekend mornings in contrast to busy Manila and increasingly, Baguio in the Philippines. The Kiwis are making spoken English all their own by mixing it up and blending their own unique flavour into it. To the untrained ear, Kiwis may sound very much like Aussies but you will eventually notice the differences. Even the British influence over spoken English is being changed to something uniquely New Zealand. There were, indeed, more than a couple of times when we found ourselves confused, and a lengthy explanation had to be done for us to understand (we thought we heard "text" but it was "tax", for example) so it will really take some time to adjust. There are, however, ways for us to adjust our ears to the Kiwi English. Thank goodness for the Internet radio! Now you can get your fill of Kiwi English through the internet. 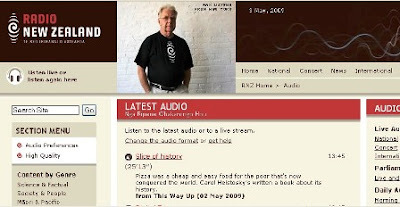 Try the following for size: RadioNZ and MoreFM. I like MoreFM because the buses are tuned in to this station more often than not, and they play 80s music! Plus they have a lot of interaction with callers and so you get that local flavour. There is also a list of radio stations in Wikipedia you can choose from. Of course this is no problemo if you are already here in New Zealand. But you can also try out some soap operas that are being broadcast in the internet. Some of the shows on Free-to-air channels are re-broadcast on the internet through tvnz on demand. 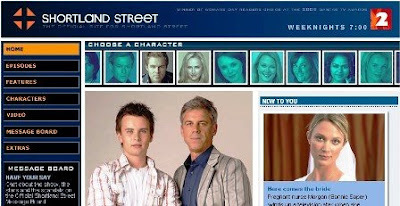 One such show is Shortland Street, a soap opera and drama television that started airing in 1992 and is still going strong! 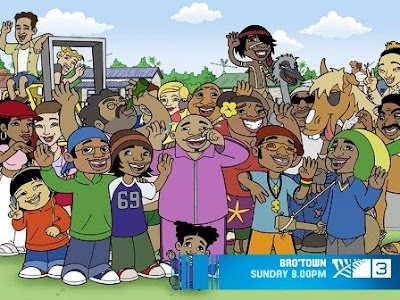 A fun way to learn about the local culture and listen to some Kiwi speak is bro'Town, a cartoon series which focuses on the life and times of five Auckland teenagers. This is shown on TV3 on Sundays at 8PM. 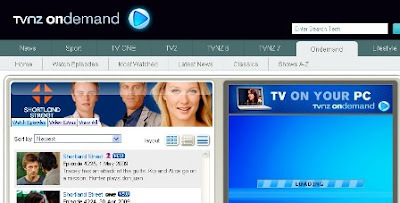 Episodes are also available in the Net but are, however, available only to New Zealand viewers. Hmmm... I haven't tried searching for New Zealand podcasts yet but there must be some out there. These are just some ideas to get you started with familiarizing yourself with Kiwi speak. It can get confusing, but it's all part of the learning process. 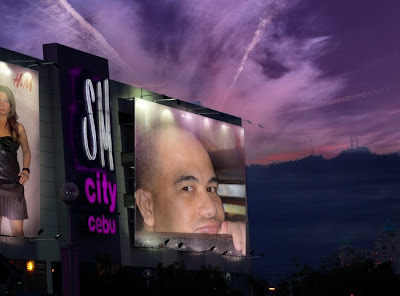 The Philippines is largely an English-speaking nation. English is the medium of instruction in the vast majority of schools (shall I say, all? ), and with the majority also able to speak Filipino (previously called Tagalog) plus a third, local dialect, I'd say we are pretty much able in terms of linguistics. So moving to an English-speaking country will be no hassle at all! Right? Well... that's a yes and a no. Yes because our accent is generally understandable. Of the many people I have talked to, I have only encountered two so far who have asked me to repeat what I have just said more than once in a conversation. We can carry on a pretty decent discussion with them. There have also been a couple who correctly identified me as Filipino based on my accent (and I didn't realize we have a unique accent!) because they have Filipino friends. And then, there are words that completely replace terms we are familiar with. A 'baby carriage', for example, is a 'pram', 'gasoline' is 'petrol', 'restroom' is 'loo' or 'water closet (WC)'. That said, we can pretty much get along rather well with the Kiwis. Here in Wellington where cultural diversity is rich, many terms we use (such as bathroom or restroom) is generally recognized.